Happy Thursday y’all! After the trip to New York I am LOVING white. I am usually a color girl but I am loving this crisp neutral pallet. 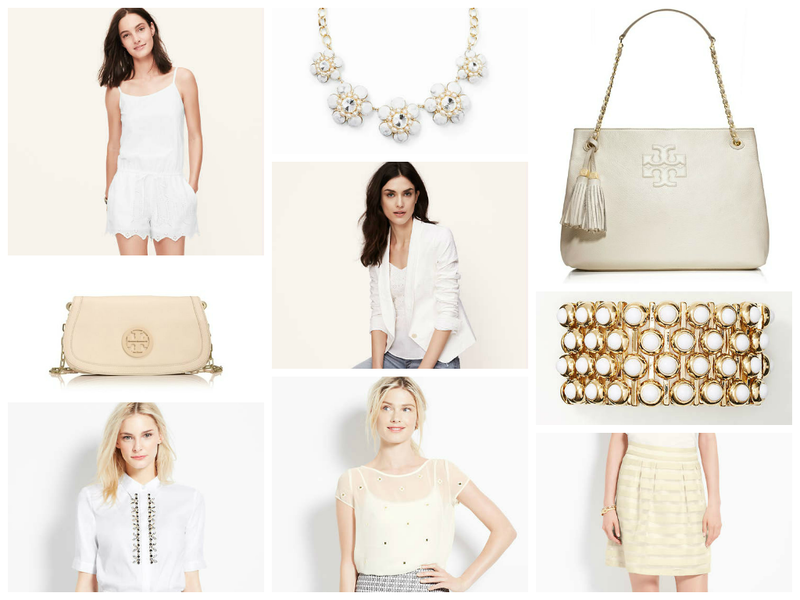 You can easily add a pop of your favorite color or make a statement by going ALL white. You can even mix white with winter white and it looks fabulous! Here are some of the current things I am lusting after! Cotton Eyelet Spaghetti Strap Romper [Loft]- Rompers are all the rage and a great way to stay cool this summer. I love the simplicity of this white number. Amanda Logo Clutch [Tory Burch]- Great for an evening out and a classic piece! Embellished Perfect Button Down [Ann Taylor]- The name says it all! Such a fun twist on a classic piece. Peacock Cluster Necklace [Ann Taylor]- This great necklace is embellished and I love me some SPARKLE! Would go great with so many different outfits! Floral Jacquard Jacket [Loft]- The structure of this jack is fabulous! Again another versatile piece that you should have in your wardrobe! Mirror Embellished Top [Ann Taylor]- This blouse is so versatile and fun! You can dress it up with a skirt and blazer or down with a pair of skinnies…. Also, will keep you cool in the HOT summer. Thea Chain Should Slouchy Tote [Tory Burch]- I love the structure of this bag with the hint of fun in the tassel! I have been obsessed with tassels lately so of course this was a pick for me! Bubble Stretch Bracelet [Ann Taylor]- I love the fact this bracelet is stretch and not a bangle. I have such small wrist that bangles tend to fall right off my hand! Love the gold and white contrast and would go great with so many outfits. Striped Organza Skirt [Ann Taylor]- Y’all this skirt is EVERYTHING. I have been ogling it since i saw it in a window display in NY. So fun yet chic at the same time. What is your favorite trend right now? Do you have a staple white piece that you LOVE?